A Spirit Feather symbolizes a New Beginning, a Spiritual Evolution, Divinity, Inspiration, and Good Fortune. Whether you choose the Spirit Feather that catches your attention and awakens you, or your loved one chooses one for you, it is a gift that will surely enlighten you. Your Spirit Feather will always remind YOU that YOU are loved. From the moment I conceived the idea to create Spirit Feathers, I felt an overwhelming source of enthusiasm and positive energy. I knew I had discovered a form of creating attractive combinations of vibrant colours in a form that also brought a sensation of Spiritual energy to me. I LOVE designing the Feathers and embellishing them with natural beads and leather. I LOVE the response and reactions I have been feeling from all of my encounters who have chosen their Spirit Feathers. My Spirit Feathers are created in limited editions. I create 10 to 20 of one colour combination. The following edition I choose a different combination of colours for that particular pattern. They are 6"-9" long. 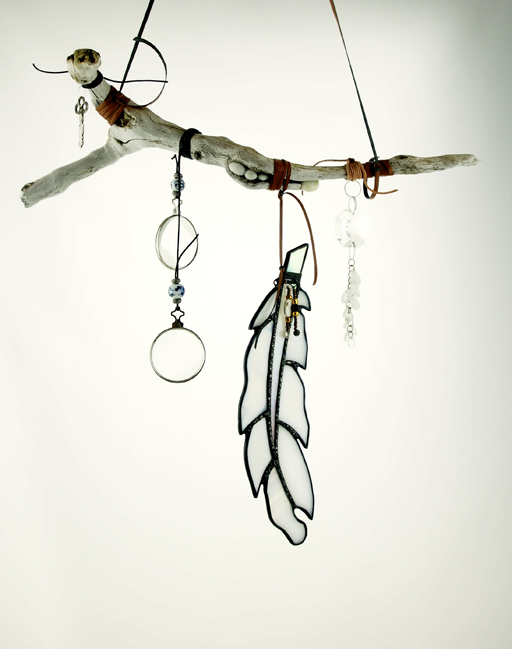 Sold separately or in clusters hung from driftwood from my local beaches or wrought iron rings. I create very large (18"-22") detailed individual feathers, as well as very small feathers. I have an eternity of ideas bubbling inside, waiting only for moments in time to come alive.